The 12ft x 8ft Waltons Overlap Apex Wooden Shed is well suited to larger gardens and offers excellent value for money. The roofline is a traditional apex style that provides maximum headroom inside, it also helps with water drainage due to the sloping nature of the roof. Sand felt is supplied to combat any potential water damage that could be caused by the weather. 8mm thick overlap cladding takes place on top of the internal frame to create a rustic finish that is water resistant. The cladding is supported by a 28mm x 28mm wooden frame to make a robust garden shed. The floor and roof are made from 9mm thick solid sheet material to create a solid base that is ideal for the storage of everyday items such as lawnmowers and bicycles. The windows are made from shatterproof styrene glazing, making them ideal for buyers with busy gardens or allotments. The layout of the windows has been designed to allow for plenty of natural light in. The double doors have been manufactured with ledged framing on the inside to provide extra support, a butterfly catch has been included to keep the doors closed. A pad bolt can be added if you require any further security. Our Reply:Good morning,I tried calling earlier and left a voice message which I hope you will be able to pick up later. We were hoping to discuss the points you have raised as this is not something we have come across before. Please contact us on either 0800 029 1000 or service@waltons.co.uk. Review:As stated came with damage to 2x side window panels and 1x gable end. Not well made or put together and more flimsy than i had expexted. Our Reply:Thank you for your feedback, I am sorry that parts were damaged in transit and notice that you have received replacement parts. I am so glad you were pleased with both the service and value for money of your overlap shed and I thank you for taking the time to offer your great feedback. Review:Easy ordering, good communication, on time delivery and a good quality shed. I am glad that you are happy with the quality of your overlap shed. Thank you for sending the image - it looks lovely! Thank you again for your positive review. It is great that you are happy with the service received and I thank you again for your feedback. It is great to know that you are happy with the value for money and quality of your shed. Thank you again for your great review! Review:Excellent customer service. Excellent product for the money .. It is great knowing that you are pleased with the value for money and quality of your product, as well as the high standard of service. Thank you again for your much appreciated review. Thank you for letting us know you're pleased with your Overlap Apex Wooden Shed and the service you received from us! Review:Great product - very good quality. 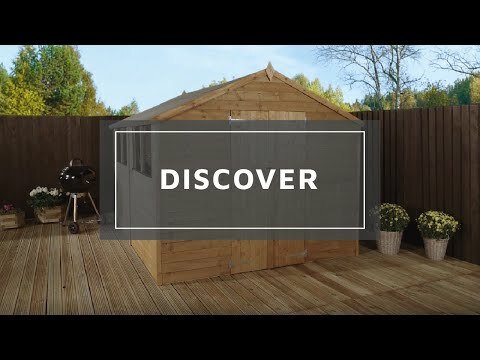 We hope you enjoy using your Overlap Apex Wooden Shed. Pieces fit together well and a solid shed once built. Thank you for letting us know your instructions for assembling your Overlap Apex Shed were clear, and that your build quality was good. Great to hear you'd recommend us! I am so pleased that you are pleased with the service and quality of your overlap shed and I thank you for your positive review. It is great to know that you are happy with your overlap shed and that it is just what you needed! Thank you again for your positive feedback! It is wonderful to know that you are happy with the quality of your overlap shed and thank you again for your positive review. I am delighted to know you are happy with the value for money of your overlap shed and the good and prompt service received. Thank you for your positive review! Our Reply:I am pleased that you find your overlap shed to be good value for money and I thank you again for the positive review. now to insulate it inside for the winter. Our Reply:Thank you for your great review, we are glad to hear that you love your new overlap building. We will take your comments about the actual build on board. Review:Very good shed very happy thank you. Will be ordering again next year good shed good price orsum. Our Reply:It is wonderful that you are happy with your overlap shed and will be looking to order again next year. Thank you again for taking the time to leave a review. Review:I haven't put it together yet as it is so flimsy that I want to add some structural braces first. It looks like poor value for money as the shed is such poor quality. Review:Very good quality shed, but windows not very strong perspex so we'll need to replace. Our Reply:I am sorry that the instructions were not as helpful as anticipated and we will take your comments on board as we are always looking for ways to improve our service. Thank you for your feedback. Our Reply:I am glad that you feel your overlap shed is good value for quality. Review:The shed after self-assembly was good. Our Reply:Pleased to know that you were happy with your overlap shed after construction and we thank you for your feedback.